This is my DIY Sump. 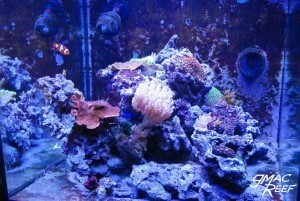 It is installed under my 150 gal reef tank in a cabinet stand. This design has been in use for over 3 years now, and there isn’t really anything I would change. It is about as simple as it can be. I recently removed the sump from the system to clean it, and took some photos. 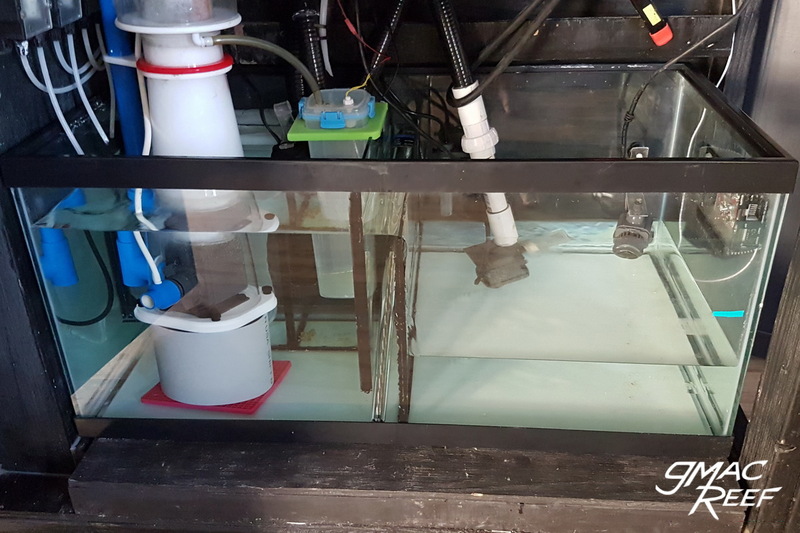 The sump is made from a new 40 breeder aquarium. It is an Aqueon brand that I bought from Petco as part of their “$1 per gallon” sale. My Mag 7 return pump pushes around 550 GPH with my 6′ of head height. The sump runs totally silent and has no sound from trickling or splashing. If you have a higher turnover rate, then noise will be heard first around the filter sock area. This is due to the narrow 6″ weir in that area. This design could run up to about 900 GPH without too much noise, just not totally silent. The baffles are all 1/4” glass taken from an old aquarium I dismantled. The filter sock tray is made from 1/2″ HDPE plastic (more info below). One thing to note – this is a general guide when it comes to measurements. While the height of each panel can be copied directly, the width may change in your case. You will have to get your own tank’s exact measurements, and make any adjustments necessary. 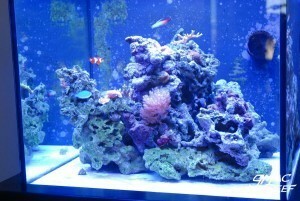 This is due to the fact that aquariums are made by hand, and every tank may be slightly different. Check out the Reef Tank Sump DIY Guide for help with construction. 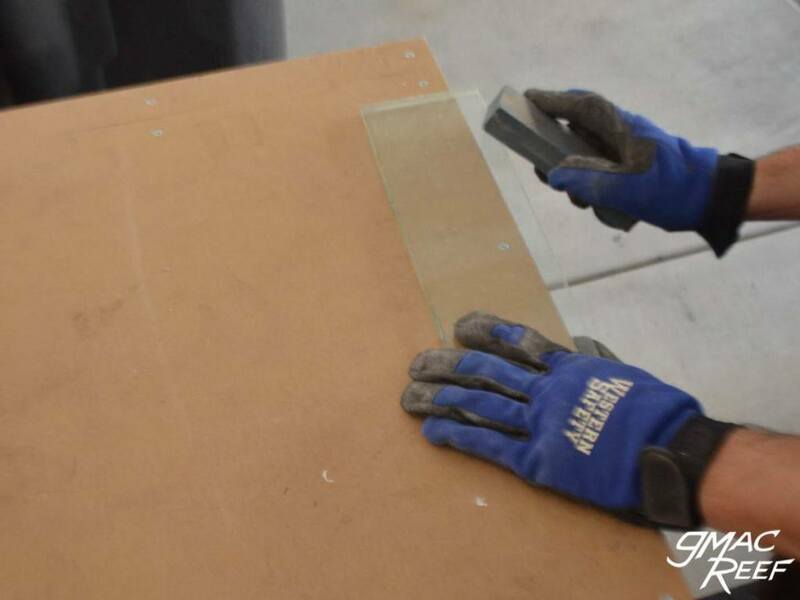 It shows how to properly measure and cut panels. It also shows how to set up and then silicone them into place. The 12” baffle (the last one in the series) sets the height of the skimmer chamber’s water level. The sump holds as much water as possible during normal operation (about 25 gallons), while still allowing for drainage when the return pump is shut off. If you are trying to design your own sump, and figure out what size and height to make sump baffles, look to the Sump Design page. The notches cut in the bottom corners of the baffles allow water to pass under, similar to a raised baffle. These seem to work well for this tank at the size I made them, however if made slightly smaller they would still work fine. To see how I cut them, go to the Sump Baffles Construction page. This sump has an under-over series of 2 baffles. This is sufficient at getting rid of the small amount of bubbles that the skimmer occasionally produces (such as when it is cleaned – but only for a day or so). While often seen, 3-Baffle bubble traps are unnecessary and just take up a lot of room. Long weirs and slow flow work best. There is a filter sock tray that holds 2 X 4″ filter socks (mine are 200 micron mesh type). The tray is made with 1/2″ HDPE plastic (aka Starboard). The tray was first cut on the table saw to size, then a router was used to create the rabbet notches on each end. You could also just do a few passes with the table saw to remove the material. I also used my router to remove some material so the water flows down into the socks better without getting hung up on the “lip” of the socks. This isn’t totally necessary, but it does work better to keep it quiet. In the the original photo it was difficult to see the shape – I have traced over the edges in Photoshop to show the profile. With this design, the tray needs to fit tightly. It should not allow any water to bypass the socks. Whenever you are making a piece like this, it is always a good idea to make a test piece first. That way you figure out your dimensions before you cut your “good” material. This piece of glass siliconed to the tank simply gives the tray a place to rest on. It’s dimensions don’t matter much. Again, the shape is a little hard to see so I have traced over the image to better show the rabbet on the front edge. The holes were first cut with a hole saw drill attachment. I chose the bit that made a hole slightly smaller than what I needed. I then used my handheld router with a straight bit to inch up the size of each hole, a little at a time. I had a sock on hand to test fit as I went along. This made for a snug fit for the socks so they can’t float up. The notch on the panel shown allows for the chamber to overflow into the skimmer chamber if the socks clog up. The sump placed back in the cabinet and filled up. Left to right: Skimmer, Skimmate Container, Heater, ATO sensor, Return Pump, and a Powerhead in the right corner. 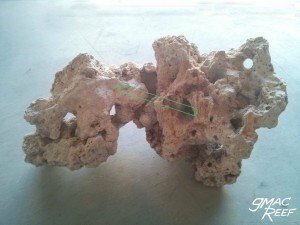 Reef rock aquascaping is easy with the right tools. It can be a decent amount of work, but it is satisfying to make something completely custom in your tank. This post goes over all the steps involved in taking dry rock and creating a stable rock structure. 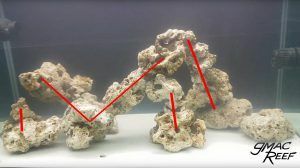 Securing your rocks has a few advantages, aside from just getting away from the typical pile of rocks you see in so many reef tanks. Creating a structure means the rocks won’t be knocked loose for any reason. This protects your corals and livestock from falling rocks and makes it a lot easier to work in the tank with your hands. 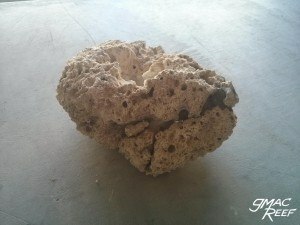 Many of the same techniques apply to wet live rock as well, but cement needs a few hours to cure. This means wet towels or newspaper must be used to to wrap them while they are out of the water. This will minimize die-off. Using dry rock means it will take a while to look as good as true live rock in the tank. This may take several months to a year, depending on the tank and system. 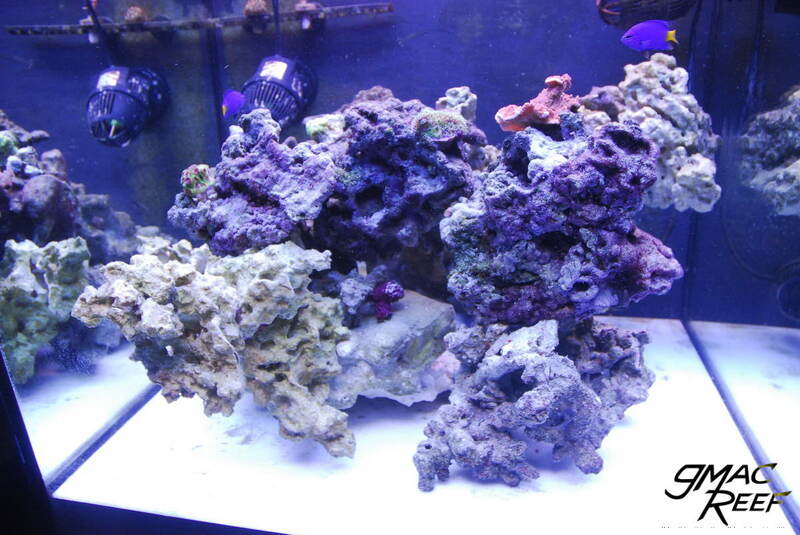 Over time, the growth of live corals and coralline algae will cover the rock structure and make it look more natural. The rate of growth will be mainly dependent on the chemistry and dosing schedule of the tank. See this progression of photos spanning 11 months. Notice the lighter rock on the left front side. The type is BRS Reef Saver. When you are buying rock by the pound, sight unseen, you will get some nice pieces and some not-so-nice ones. If you have the option you should order a couple pounds more and then pick and choose what pieces you use in your tank. 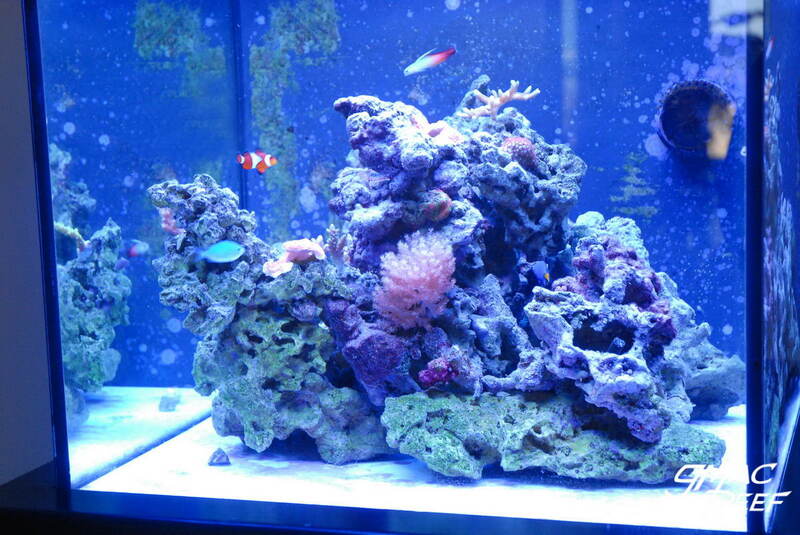 Large, blocky pieces of rock often won’t look all that interesting in the tank. That said, you can do a lot to the rock with some effort and the right tools. For this you can use a drill with a masonry bit, or a hammer and chisel. Holes and caves can be added to each piece, and you can split apart big pieces. 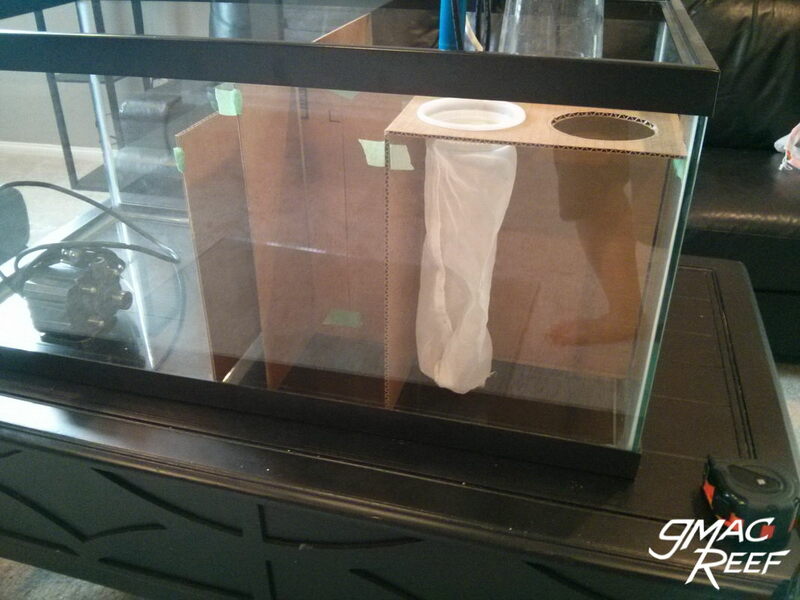 This creates more hiding spots for fish and can improve flow in the tank as well. This is bound to happen as part of drilling, especially if you are trying to create many holes. Try to let the bit do the work and don’t press too hard. Once a split happens, the best thing to do is take a rubber band and put the rock back together right away. Otherwise, you’ll have a hard time putting the puzzle back. Set the pieces aside so you can use putty to reattach them. In addition to spinning, the bit vibrates in and out. It makes a big difference! It can make drilling rocks a piece of cake. You may want to pick up a cheap hammer drill for this, because using a normal drill is going to take a lot more work. These have a spade-type cutter on the tip and are made of hardened steel. 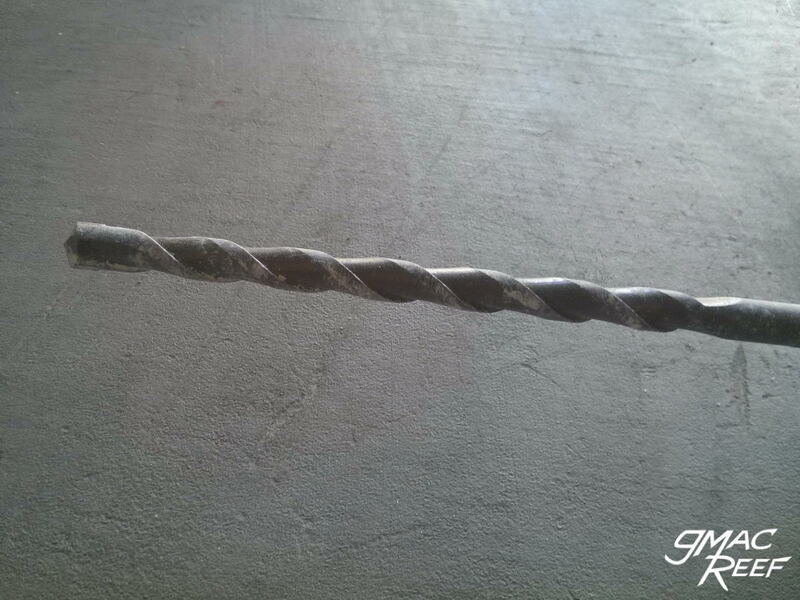 Drilling and chiseling live rock or dry rock can be hazardous. 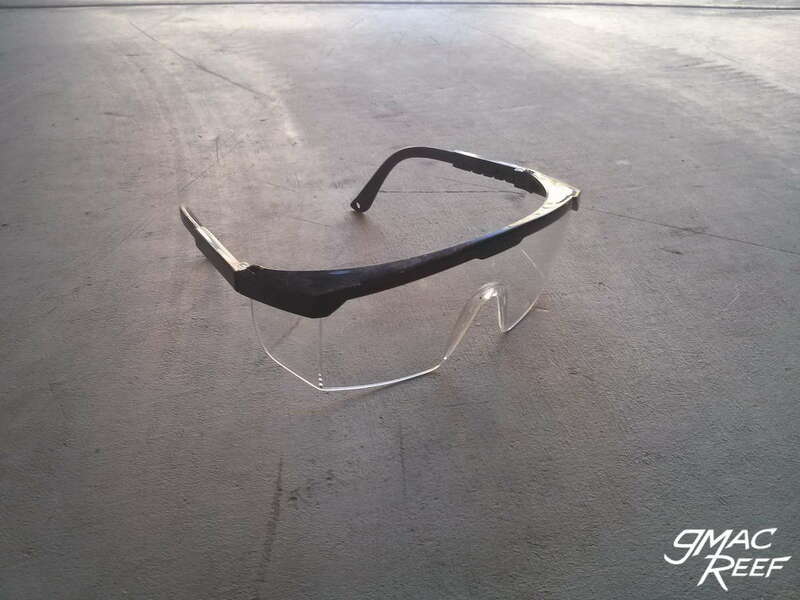 Safety glasses are mandatory. There can be a lot of shrapnel with dry rock, and there can be toxic things living on live rock that you will want to protect yourself from. Now clean your room! Shaping your rocks is a messy job. It can take a while. You will need a good open area to work in. Doing this outdoors is a good bet. A soft ground surface like grass or gravel can also make drilling easier. A towel or piece of old carpet on the bottom will help keep the rocks still while you work on them. If working outside isn’t an option, You can also do your drilling in a large storage bin or tote to keep most of the mess contained. Using plastic or acrylic rods inside the rocks is a common way to add strength. The rods act as a skeleton for the structure and can be completely hidden. Holes are drilled in each piece of rock, then sections of rod skewer one or more of them together. 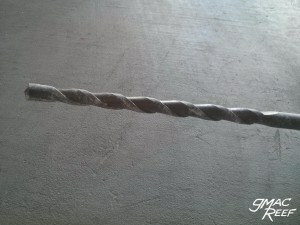 After the rocks are cemented together, the rod will act similar to Re-bar in concrete construction. 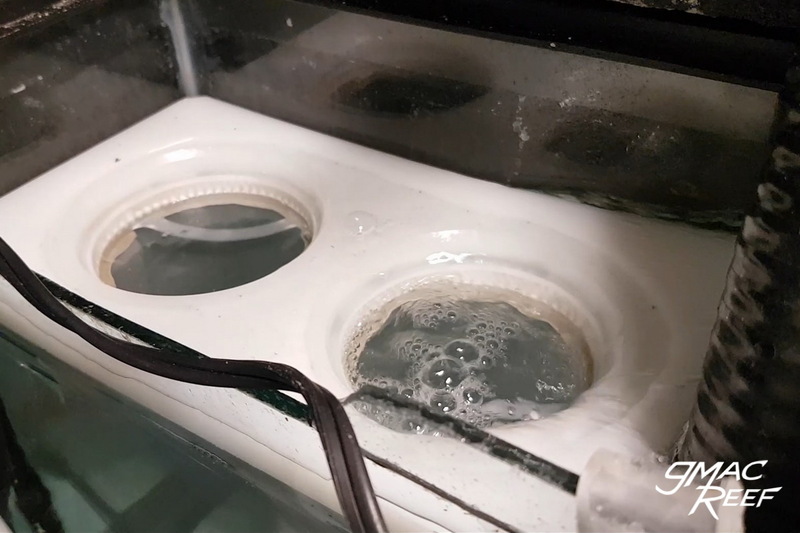 Small sections of rod are also sometimes used for raising base rocks up off the bottom of the tank by a few inches — usually done for better flow in the tank and to eliminate places where detritus settles. 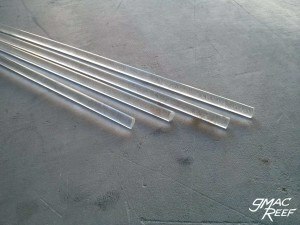 For material, many kinds of plastic dowels can be used such as plastic coat hangers or fiberglass driveway markers. 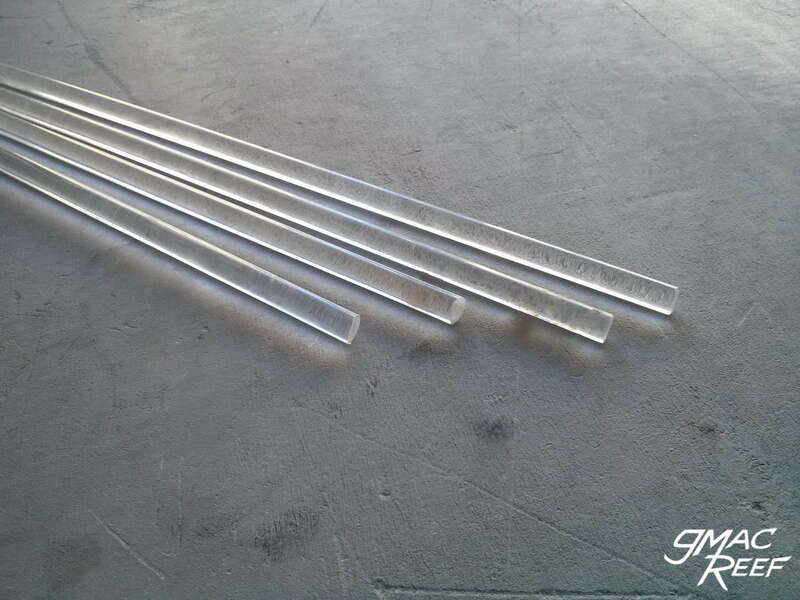 Clear acrylic rod is the most common choice because it is the least visible in the tank, however most of the rod will be covered by cement or putty anyways. A good way to start is just by drilling a few holes all the way through the rock. 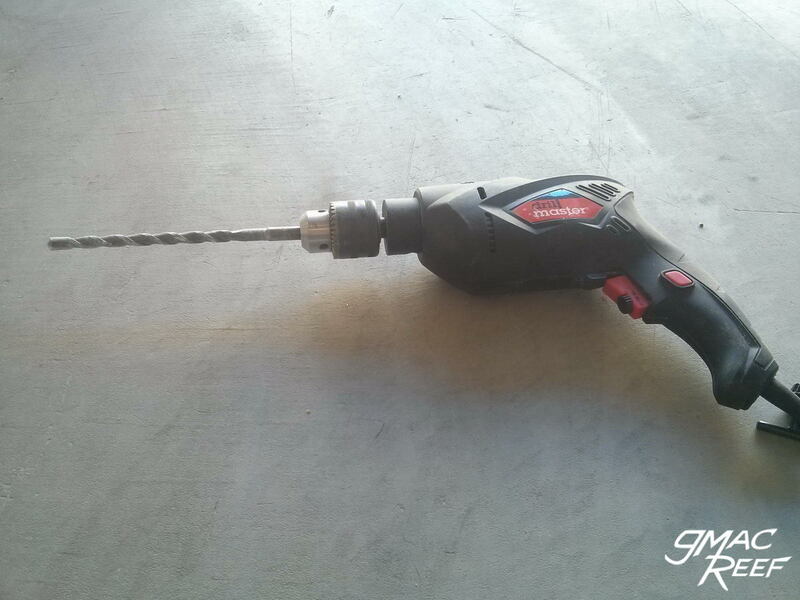 The holes you drill should be the same diameter as the rods you are using. The holes will need to be bored out a little to make the rod slide in but also be snug. Once you’ve drilled a few holes, just see what you can come up with. Don’t worry so much about having a vision or planning, just see what interesting shapes you can make with the rods and the rocks. Once you find a combination you like, you can start using putty or cement to make it permanent. Try to position the rocks on the rods so that the two pieces make good contact or interlock together reasonably well. This both hides the rod and makes a good strong connection. Once you’re done drilling and chipping, you’ll want to clean the surface for better adhesion. The best way to get rid of all the dust on the rock is to blast it with an air compressor. Dust-free rock makes the cement or putty grab much better. A vacuum can work too, but not as well as an air compressor. Again, wear eye protection. Acrylic Rod / Driveway markers etc. 2-part putty is good for attaching small pieces (say under 1-2 lbs) or for re-joining pieces that have broken apart. Once the 2 parts are kneaded together the putty becomes sticky and easy to work with. The putty is a good choice if you need say a 1″ marble-sized amount of material. It’s also good at supporting the weight of larger pieces but you must use a lot of it. It works well but it’s not very cost effective if you have a lot of rocks to join. 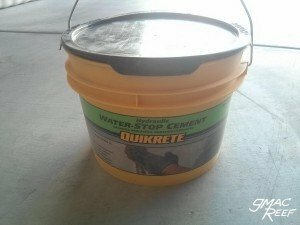 20 lbs of (dry) cement costs roughly the same as 1/2 lb of putty. 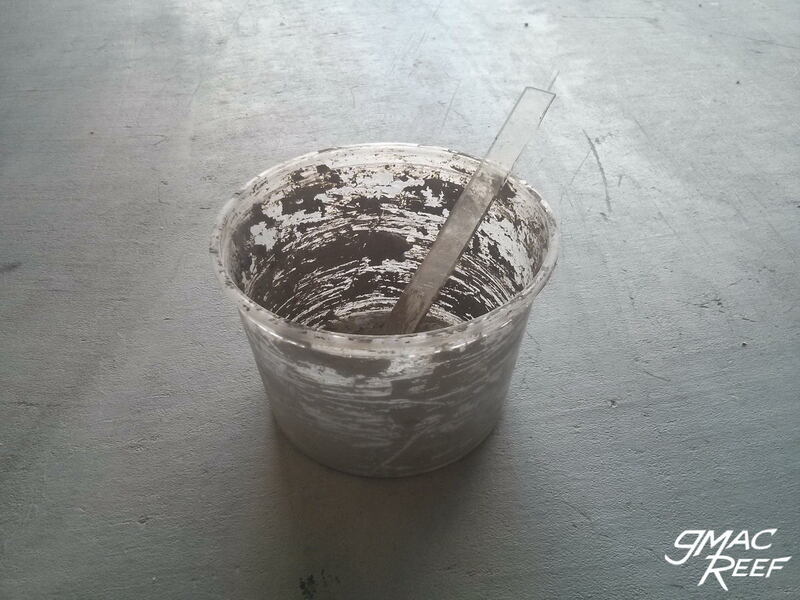 The plastic bowl you use as a mixing container can be reused over and over. It should be scraped out immediately after each batch is made. 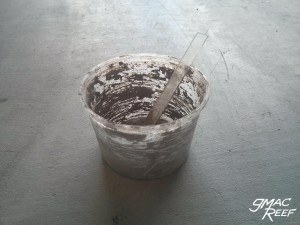 With a small stir stick, you can start adding water and quickly mixing the mini-batch of cement. After 30 seconds to a minute of mixing, it will start to cure. The time to apply is when it is about the consistency of peanut butter. A Play-Doh consistency means it is too dry – add more water or start over. If the cement is applied at the right consistency, then it will flow into tiny crevices better. You’ll most likely want to paste the cement onto the rocks with a stir stick rather than your hands. This way you won’t smear the dark cement while getting them into position. Once the rocks have been pressed together and are in place, you can touch the cement with your hands. Using your fingers, press the cement into the joint and the natural crevices of the rock. The cement will start to firm up after only 5 minutes or so. Once you have it all pressed into the joint as best you can, try to rest the rocks in such a way where they don’t move and break the joint. After 2-4 hours it should be fully hardened. The hydraulic cement is typically very dark gray in color, which kind of clashes with the light color of most dry rock. The cement seams may stand out quite a bit. One way to counteract this to use small pieces of rubble and stick them to the cement seams to camouflage them a bit. The rubble bits should be pressed into the cement seam while it’s still wet. You will have to work pretty fast because it cures quickly. When you are trying to get creative, taking your time and trying out a bunch of options is the best approach. Just try out different combinations, and see what will look natural or interesting. You can create overhangs, arches and whatever else you can think of. After you join a couple pieces together, you will see your pile start to come together. It’s helpful to walk around the structure so you can look at it from different angles. It’s a good idea to think about how many main pieces the final structure will be made up of, as it’s going to be much easier to move a few pieces that are 15-20 lbs each rather than a giant one. 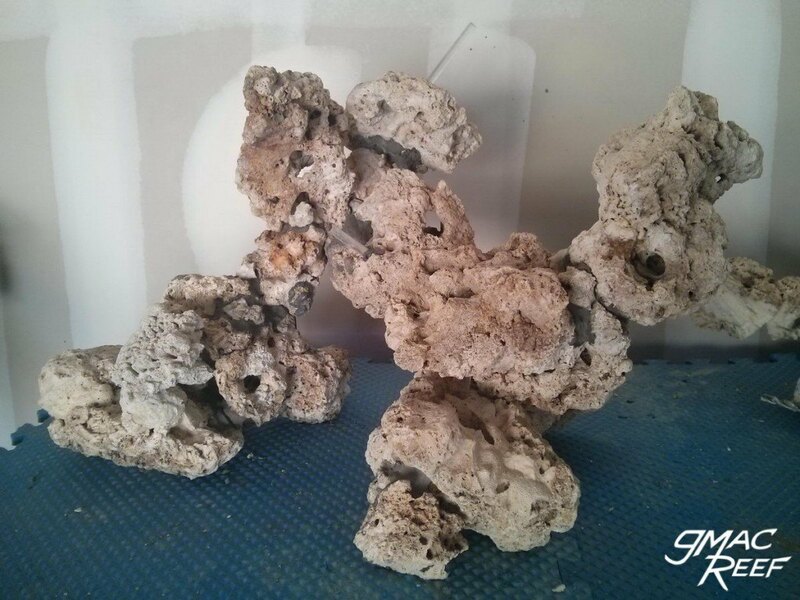 If you are using dry rock, it can be a good idea to soak your rocks in RO water for a few days. With this build I did a 1 week soak in RO water before putting it in the main tank and starting the cycling process for the new tank. There are a few reasons for doing this. First, if you drilled your rock then there’s quite a bit of dust on them and in all the holes. Good to get that out in the water you drain out early. Second, there are a few types of Reef Putty are known to cloud the water quite a bit. Cement doesn’t seem to, but it’s still a good measure. Also, some varieties of rock (such as previously live rock that was allowed to dry) may leach phosphates into the water. This can be helped with soaking and changing the water. While it’s good to use Reverse Osmosis or RODI water for long term soaking, there’s no need to be too concerned with spraying off your rocks or quickly dunking them with water from your garden hose. 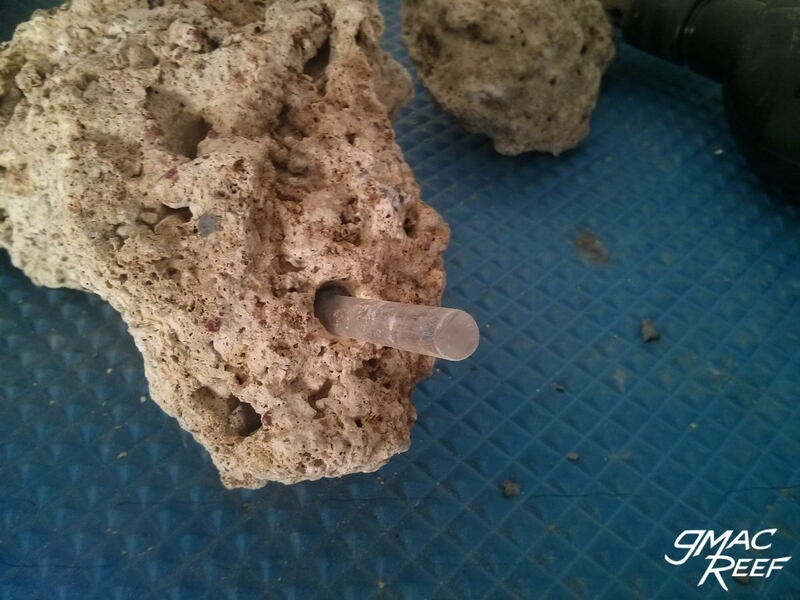 You want to be very careful when placing the rock inside the tank. It’s best to add it with some water in the tank already, as the rocks will feel lighter from the buoyancy. Be aware of the possibility that the joined rocks will come apart in your hands and fall in. Rocks and glass, need I say more? If you have any tips of your own, leave a comment! Thanks for reading. Live rock has the potential to harm you. Palys, Zoas and Xenia are some of the corals that secrete very toxic compounds, but there are others as well. When working with live rock, these organisms can release their poisons. The harmful effects can range from say some skin irritation to a serious medical emergency. Wear gloves and eye protection if handling live rock or previously wet live rock. Some people boil live rock, but this is not a good idea. Boiling can vaporize toxic substances and make them airborne, making it possible to sicken many people in a household. There are many instances of this in the news. Soaking previously live rock in a solution of bleach or acid is a much safer and effective method of removing organic material from live rock. Always do this stuff outdoors. 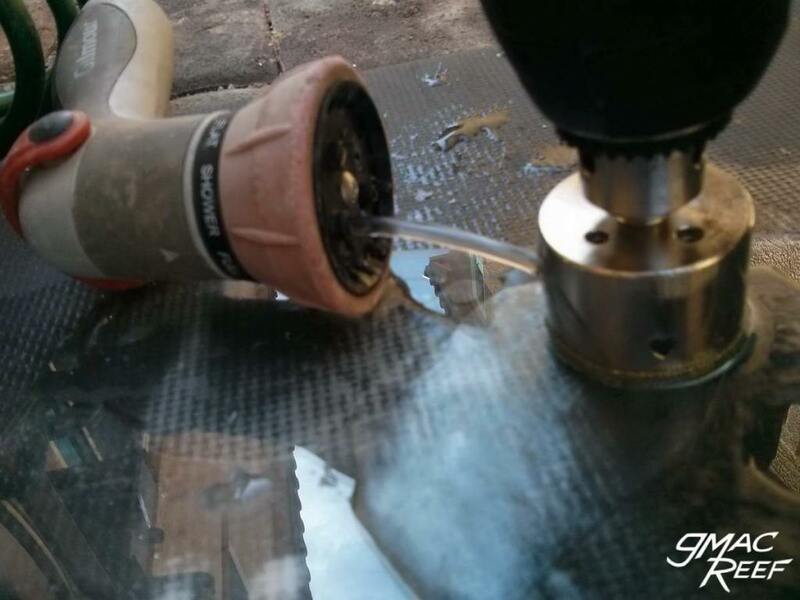 How high to make baffles – See Sump Design post as it’s different on every sump. Once you figure out what water level you need in each chamber, you will be ready for this guide. We’ll go over how to carefully measure the baffles for the right fit. After prep work and cutting the glass pieces, you can start on actual assembly. You don’t have to shell out hundreds to get a sump that looks good. 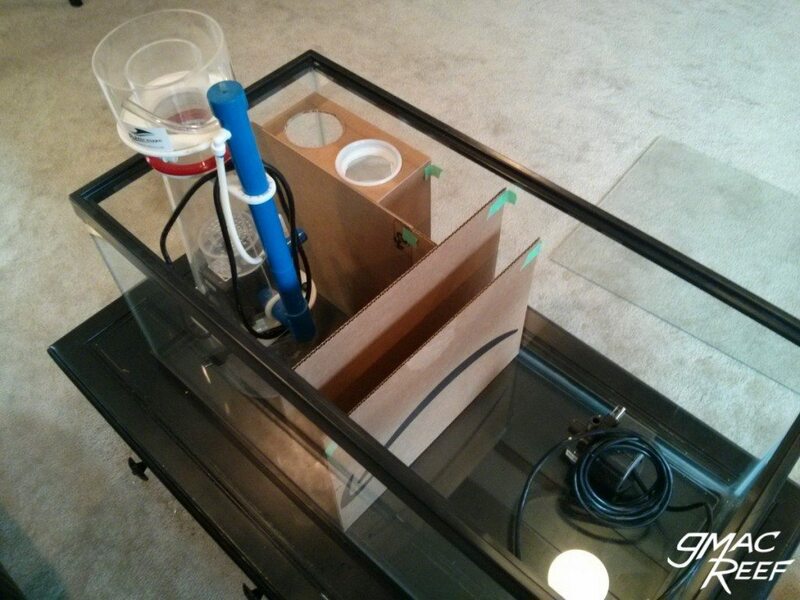 While it’s a little more work, you can build a decent looking sump with your own two hands. This guide goes over the methods to make it happen. You may have seen some sump building videos on YouTube. There are quite a few. Many of the the people that make them seem to care about showing how fast they can do it, rather than doing a good job. They often end up with silicone gobbed all over the place or with baffles that leak and have to be redone anyway. One thing you often hear people say about sumps is “small leaks aren’t a huge deal” and that sort of thing. This is not true. If you have an unintended leak between baffles or dividers, it can cause problems. These problems may take a while to show themselves, say with an ATO sensor. It’s best just to do a good job with your seals the first time. Leak test the sump as you would any other part of your system. The methods in this guide are some of the same ones used by professional tank builders. First, the tank and panels are taped and prepped. After that, the baffles are bolstered into position. This is usually done with clamps on the edge of the tank holding small blocks of wood. Next, silicone is injected into the gaps. After smoothing, the result is a continuous bubble-free seam. Applying the silicone in one quick process prevents it from “skinning over.” This is when the outer layer begins the curing process and begins to toughen. Professionals all have their own tricks of the trade, but this guide gives an outline of a way to copy them. It is not the only way to do it, but it results in far less air bubbles in the seams than other methods I have tried. 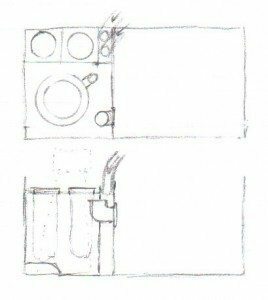 Once you have planned out your sump and know the rough dimensions, you will want to come up with your final dimensions for each piece. 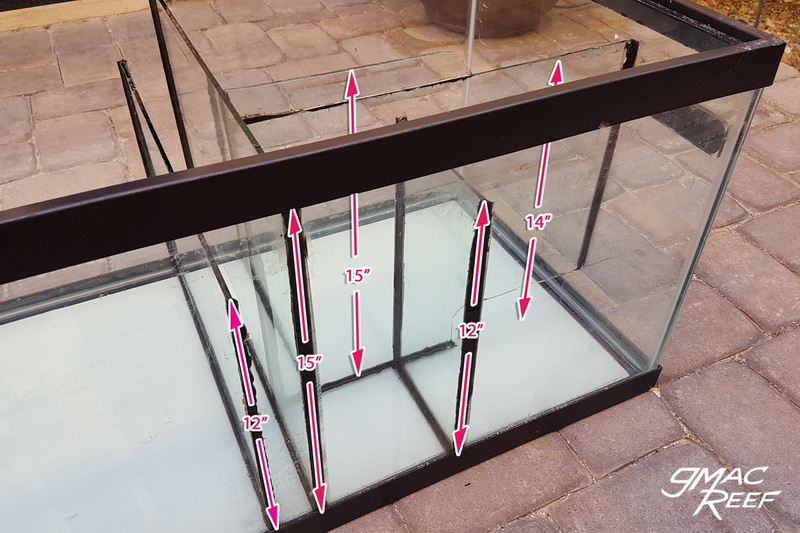 How to Measure – Allow about 1/16″ (1.5mm) to 1/8″ (3mm) gaps where the baffles touch the walls of the tank. This allows you to inject the silicone so it flows in the gap and creates a continuous seal between the two pieces. A gap closer to 1/8″ (3mm) allows the silicone to flow easier into the gap, if it’s too narrow, it becomes harder to inject in the opening. For example, if you are measuring for a full-width panel that spans the tank front to back, here is what to do. Say the inside measurement of the tank is 10″ wide. You would minus the 1/8″ gap from each side, adding up to 1/4″. Subtract that from the measurement and the resulting panel needed would be 9-3/4″ wide. Apart from creating a good seal, the gap is left to avoid having to force or wedge a panel to fit which you should never do. While it doesn’t have to be too exact, it is better to have it a little loose than too tight. The silicone will fill gaps up to about 3/8″. Spacers of the proper thickness will come in handy for this. Some people use zip ties or small pieces of plastic. In this build I used some rigid straws. The spacers on the sides can be removed as you fill the gaps with silicone. The spacers on the bottom should stay for about 45 minutes to an hour to prevent the weight of the panel from squeezing the silicone out from the bottom seal. You may also want to affix very small spacers to the bottom of the piece that will be permanently in there. Once you calculate your final measurements, it’s helpful to do a mockup with cardboard. Just cut the pieces with a box cutter and tape them in the aquarium. This little extra step allows you to check a few things and identify any spacing problems with things like your skimmer or other equipment that might not be as evident on paper. It might seem unnecessary, but this does a couple things for you. Once you cut a piece of glass, you can’t really just shave a quarter inch off it if you make a mistake. You get one shot or you must start over using a new piece. It’s nice to lay out the footprint of where everything is going to go. You might discover a piece of equipment won’t squeeze into a chamber like you intended. You’ll also find out what areas will be hard to access with your hands (say for cleaning or netting out fish). 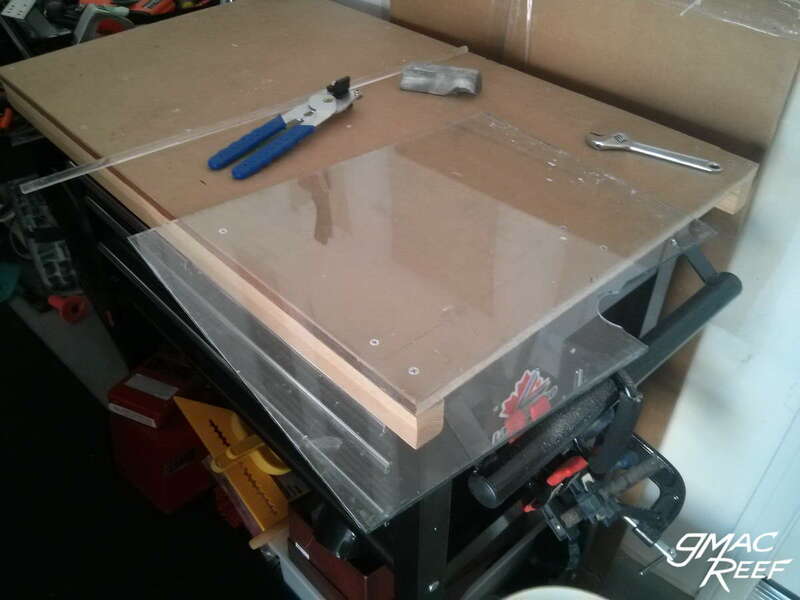 Once you do this test fitting and you know how big to make the panels, you can either cut them yourself or take your order to a local glass shop. You will need your baffles to have some strength. Strong panels will stand up to being knocked around a little. When you are trying to wrestle a piece of equipment out of there while hunched over the sump, you aren’t thinking about being careful. Even doing some aggressive scraping of the glass will test them a bit. Aside from not breaking easily, thicker glass prevents flexing or bowing from water pressure. The point is this – a broken baffle in a full sump is no fun. It means draining, drying, scraping, and all of the hassle that comes from having your sump offline for enough time to re-cure new silicone. 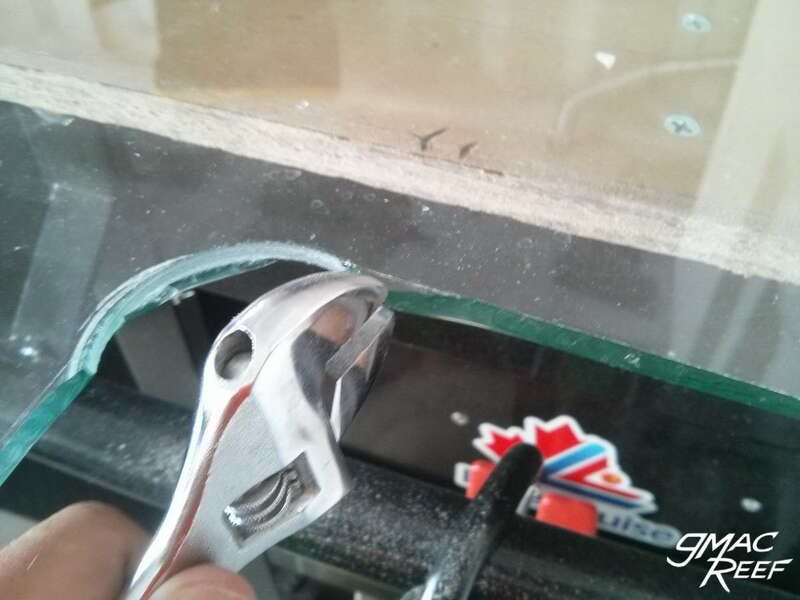 Using 1/4″ (6mm) glass is what you should aim for for thickness. 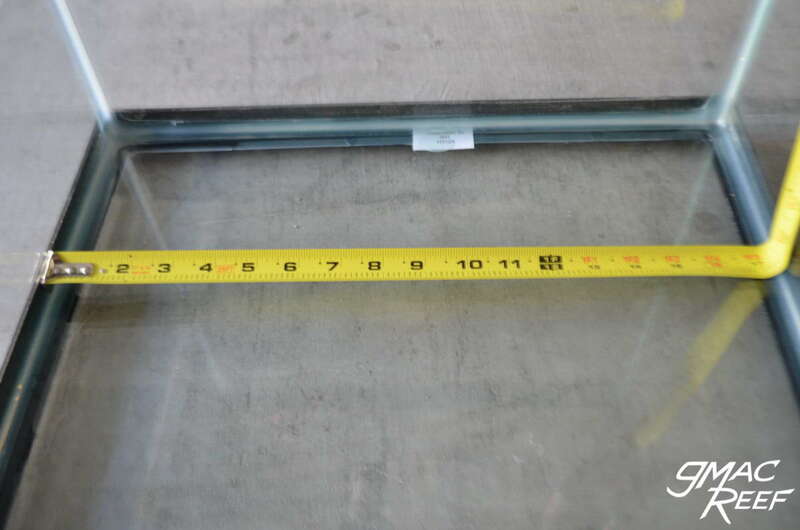 Quarter inch glass is also sometimes called plate glass. If you can’t find glass this thick, you might resort to something around 3/16″ (4.5mm), but that’s about the minimum. 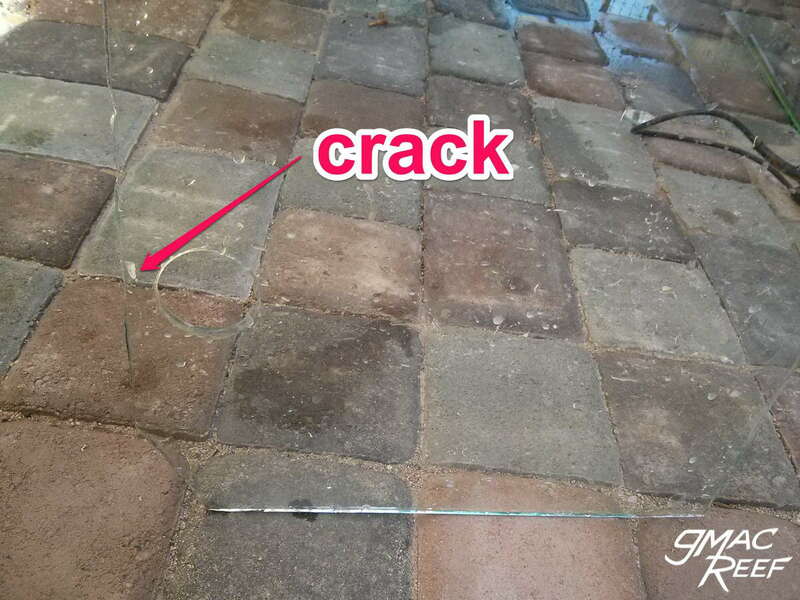 1/8″ (3mm) glass is easy to find at home improvement stores. It is too brittle and you should avoid it. A good source of glass is from an old tank. You can buy one for cheap. There are a lot of tanks on Craigslist or in second hand stores. 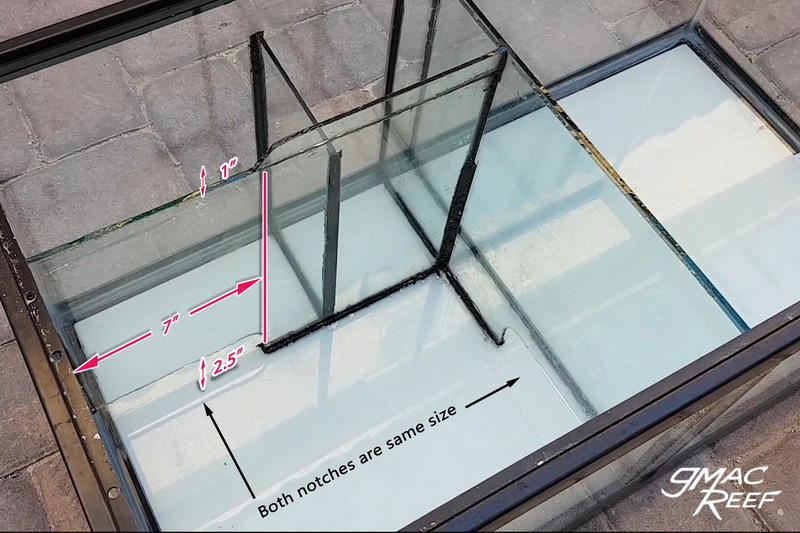 If you are looking at taking the glass from an old aquarium, start looking at tanks sized 29-35 gallons and up. Glass of at least 3/16″ (4.5mm) is found on these tanks. It can be a bit of work to dismantle a tank with razors and some wire, but you can potentially save a lot of money. Glass shops can charge a lot money for custom cut panels. Some people use acrylic baffles in their sump. This is often done because it is a little easier to cut and work with. 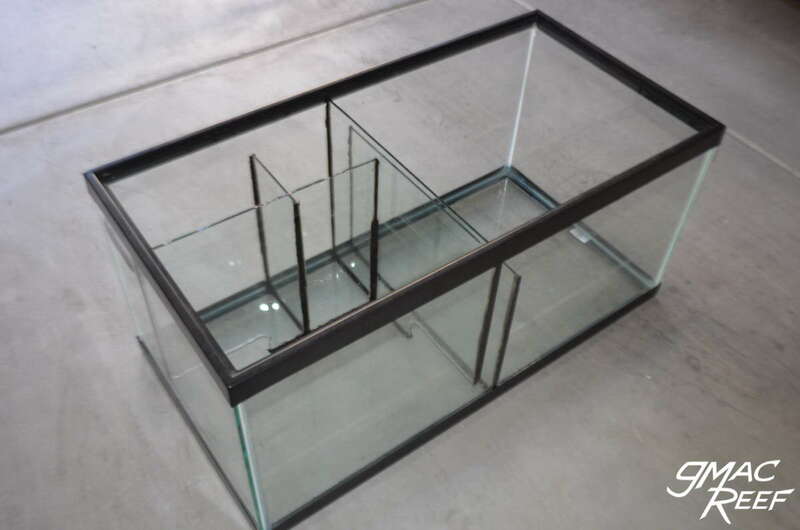 In a glass sump, you should ideally use glass baffles. Using silicone to affix acrylic panels to glass doesn’t work well in general because it can only form a very weak bond. Bulk Reef Supply actually did a good experiment to show glass vs. acrylic silicone bonding. For a strong permanent bond, glass panels work best. It is also nice to be able to use a razor blade to scrape them after several months of use. Use a brand of silicone that is right for the job. Whatever brand you choose, you must ensure that the one you choose does not have any mildew-resisting chemicals in it such as brands made for use bathrooms and kitchens. There are a lot of types of silicone available at your local hardware store but they are all low grade sealants rather than adhesives. The easiest thing to do is just to get the good stuff from Amazon instead of trying to save $5. A good brand is “GE SCS1200” which has very good strength and about 15 minutes of working time. It is often recommended by professional tank builders and what is used in the build shown in this post. Another brand that gets recommended a lot is “Momentive RTV103”. A single tube of silicone should be enough for 4-5 baffles. On this 40 gal sump I used 3/4 of a tube. 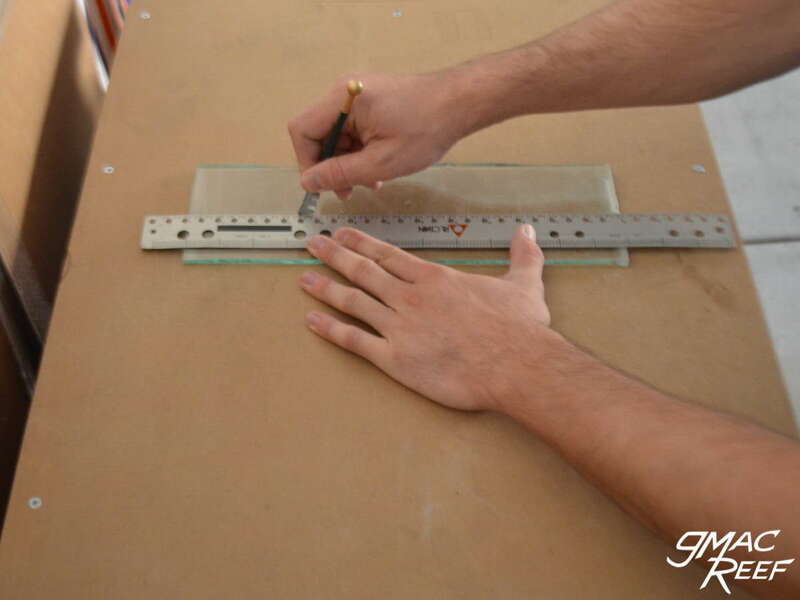 Using a standard glass cutting tool and a straight edge, the piece should be scored with a nice clean motion. Never go over the same score twice as it will dull the cutting wheel. It is worth it to do a little research on YouTube on the proper technique for this, but I won’t get into it here. 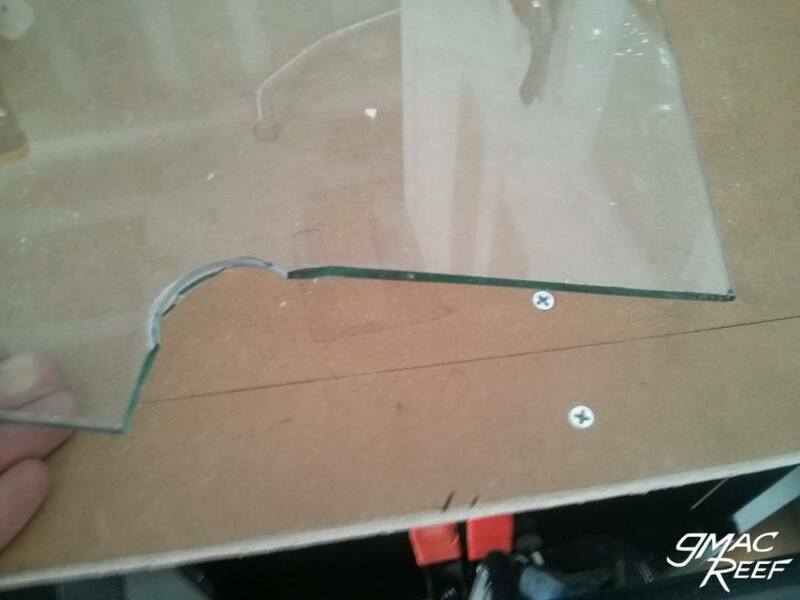 The edges of a newly-cut piece of glass can be extremely sharp. Edges should be ground with a sharpening stone or sanding block just to take off that sharp edge. Dulled edges will make it safe to reach in the sump with your hands and arms. If you are having a glass shop cut your panels, they can polish the edges but you really just need to dull them down. Wear gloves when sanding or grinding the glass. Panels that sit on the bottom will rest on the silicone of the existing tank. This something we need to be careful of because the newly cut piece may have very sharp corners. It’s a good idea to nip the corners and sand them with the sharpening stone just so you don’t mess with the seal on the existing tank too much. After cutting and sanding the edges, it’s time for prep on the pieces. You can start with wiping down the pieces with just water and some paper towel to clean them up a bit. 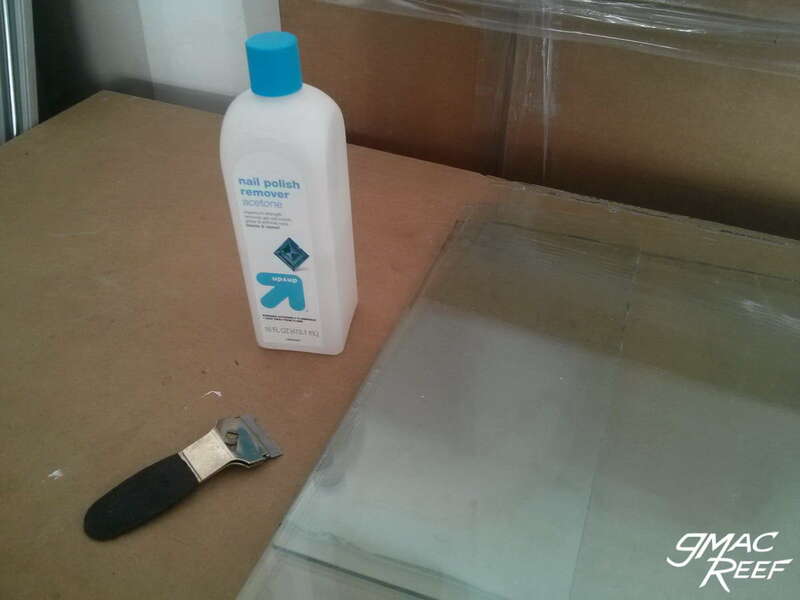 If you are using repurposed glass, you need to do a good job getting the pieces clean enough to get good adhesion. This is mostly important on the areas that will be bonded near the edges. 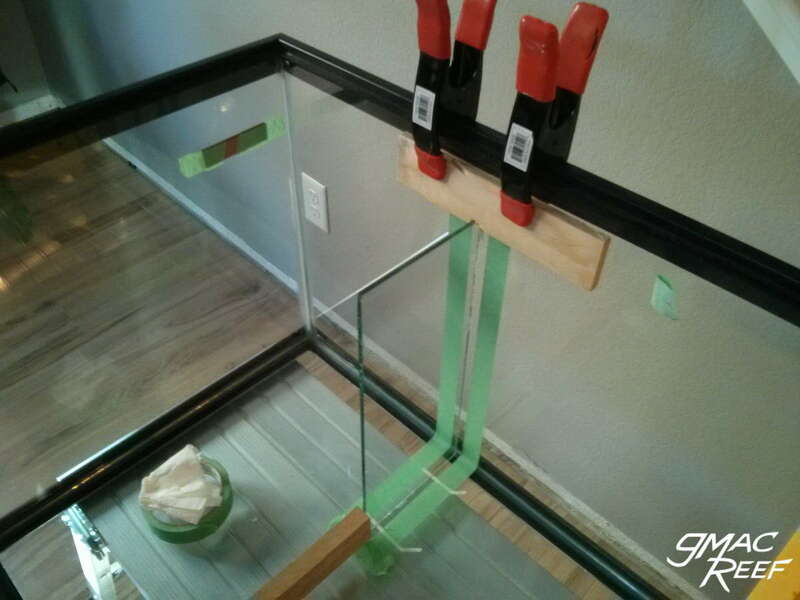 Parts of the glass that will be covered with silicone should be scraped with a razor blade and cleaned with Acetone (nail polish remover) or Rubbing Alcohol on a paper towel. It’s a good idea to take your time with this step and do a good job. 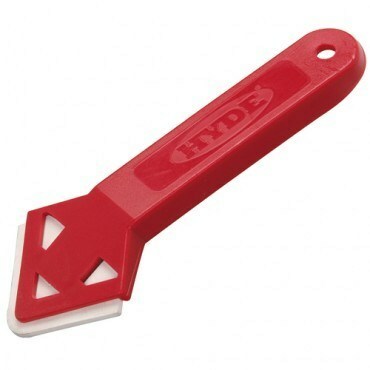 This will remove any old silicone and clear off fingerprints for the best possible bond. In the sump design post I show water moving from one end of the tank to the other, flowing from chamber to chamber like a waterfall. This is done to make the concept simple to explain and show. 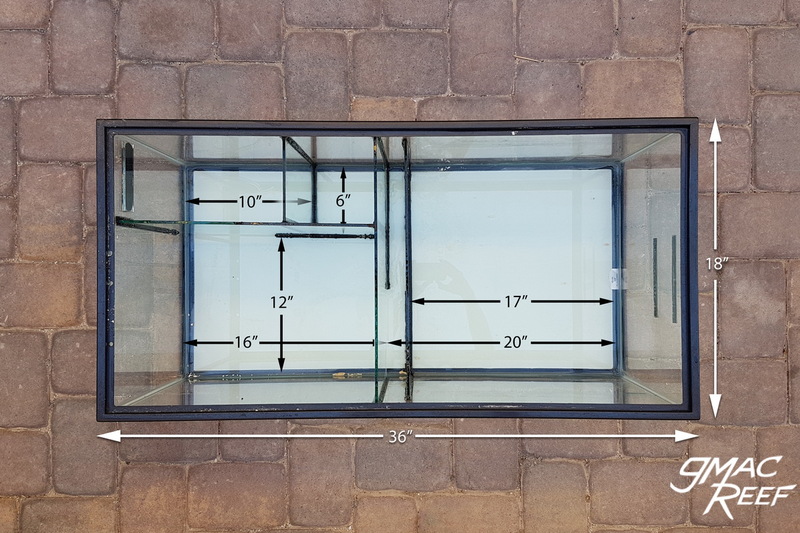 Most sumps you see are designed very simply – by placing a few rectangular baffles in there that span the width of the tank. Nothing wrong with this, it’s the easiest way. One thing to note however — while you can’t really form glass into whatever shape you want, you aren’t just stuck with rectangles either. There is a lot more you can do with a sump when you realize this. 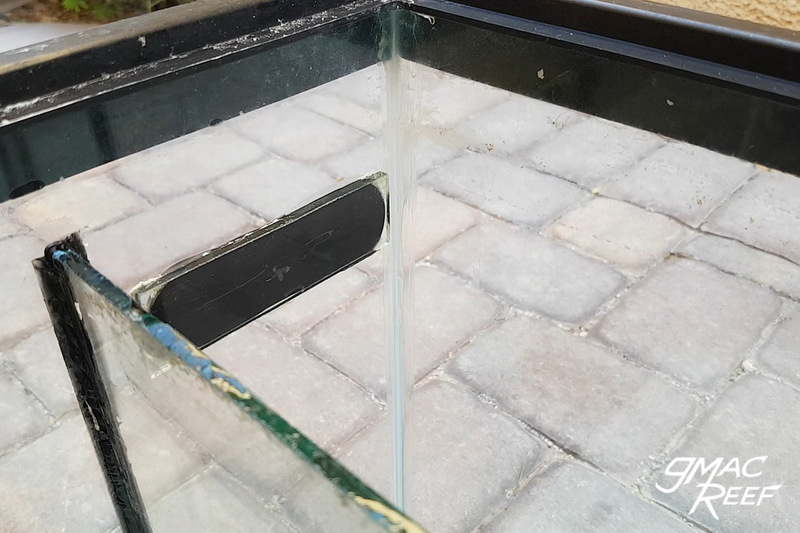 Creating openings for water to pass through makes it so you don’t need too many baffles. Fewer baffles means you save space. Cutting a notch in the corner of a baffle is one technique you can do, and this is how to do it. Here is a video showing cutting a corner notch with the same technique but with better tools and results. 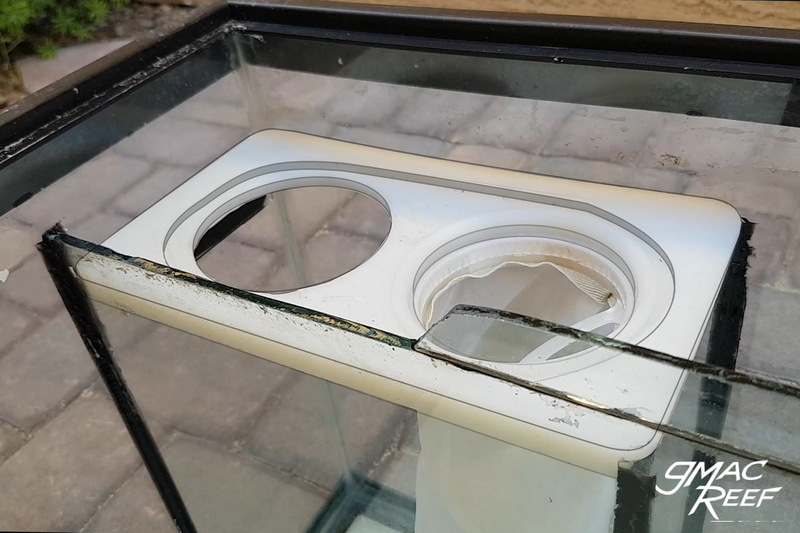 It is easier to get a good clean hole without chip-out with thicker glass. Here is where a hole has been cut too close to the edge of the glass. Hard to see in the picture, but a crack has formed between the hole and the closest edge. In this case it is what we want, but it illustrates why you need to have adequate clearance when drilling glass near an edge. Relief cuts can be scored and snapped from the edges of the hole. 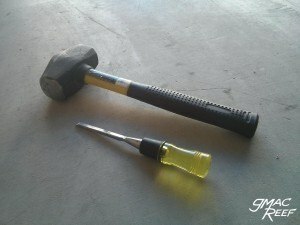 Once the snapping has been done, small bits of material can be removed with pliers or a wrench. This will result in a slightly jagged edge that may look a little rough, but can be sanded slightly with a sharpening stone. Heck, even a rock will do. In this example I am showing the process I followed on a brand new 40 breeder. 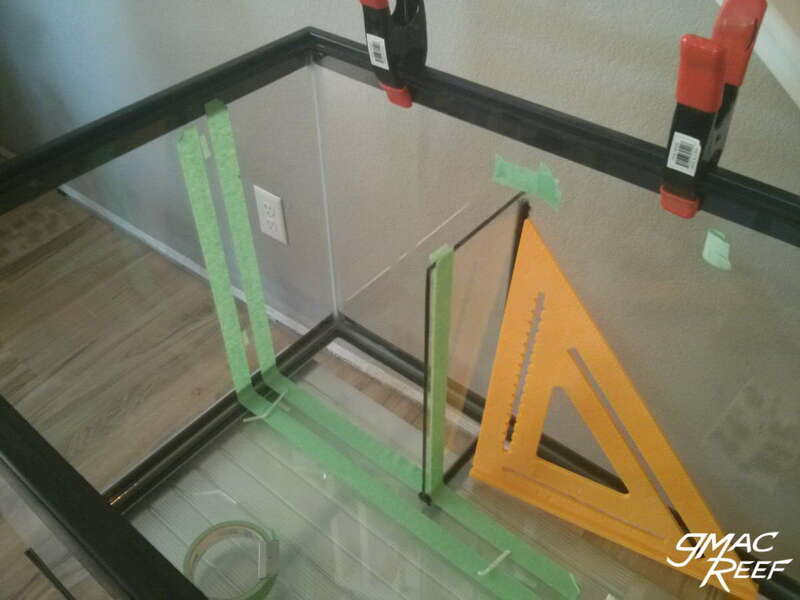 I got the glass for the dividers from an older 35 gallon that I cut apart (3/16″ or 4.5mm thickness). It is handy to have some scrap wood to help secure the pieces as you work on them. Wood blocks secured with clamps will help to hold the panel you are working on. Spacers placed around the edges will help to create the proper gap (1/8″ or 3mm) around the piece. Taking a little more time to secure the panels with spacers and wood blocks might add time to each step, but you’ll be glad you did. Silicone that has high strength has less working time than you might be used to, and you want to apply it in a quick deliberate process. Taking time to prep each seam will result in a much nicer end result. Each panel can be taped off along with the edges of the tank (as shown). After applying the silicone and smoothing it with your tool, remove the tape right away while the silicone is still wet. During the few minutes of time when you are applying the silicone, you will learn a lot. 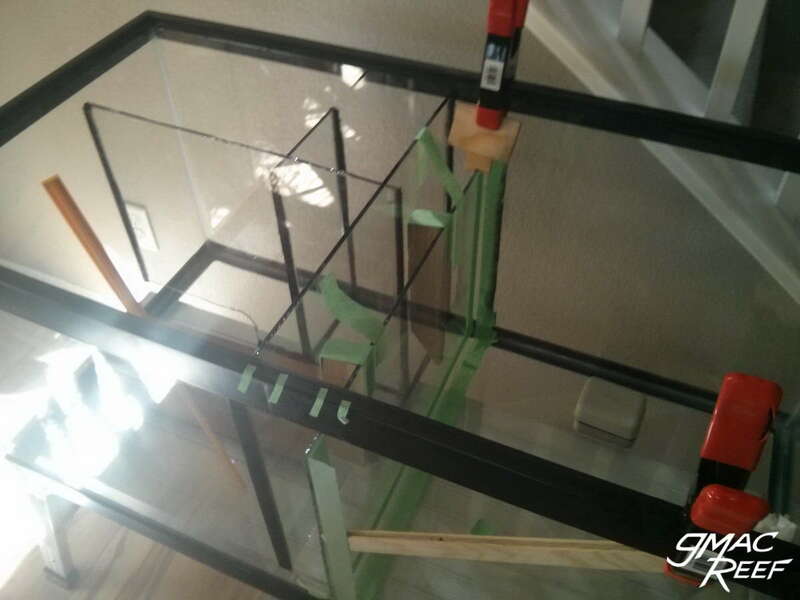 Your preparation with taping and securing the glass panels will be evident. The amount of silicone needed can vary. It depends on how you measured and cut your panels. For example, if you made the gaps between the existing tank and the edges of the panels larger, then more silicone will be needed. 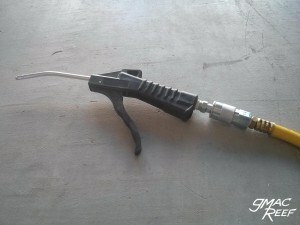 The target is about 3mm or 1/8″, so with a larger gap than that, you will be pumping the gun more. If you only left a very small gap to fill (say less than the target of 3mm or 1/8″), less silicone is required. This may make it more difficult to get a good seam however, because the tube’s tip will have to be pressed firmer into the joint as you squeeze it out. This might make you work slower, and the silicone will get tacky as you use up the working time. The way you cut the tip of the tube can also affect the process a lot. Some people cut the opening at an angle and then clench it with pliers to make it flatter. A lot of it is personal preference. 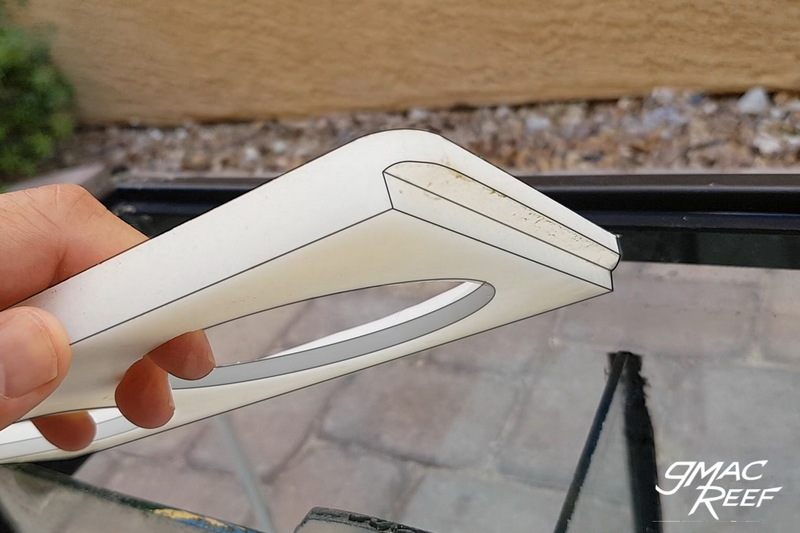 If you are working with a panel that is close to another such as a bubble trap, then you’ll only be able to apply the silicone from one side of the joint. In this case, you want the silicone to easily flow through the joint when it’s squeezed in from only one side. A proper sized gap (closer to 3mm or 1/8″) would be helpful in this situation to get the silicone to create a continuous seam. Applying silicone needs to be done swiftly to get nice looking results. There are too many techniques and concepts to describe fully, and tank building is a skilled art. Experience will teach you more than reading tips and tricks ever will. It is very important to let the silicone cure for at least 7 days. 2 weeks if possible. This is done to protect your system from the effects of off gassing in the curing process. You will discover many tips and tricks of your own as you work. Your 2nd sump with probably turn out better than your first. You will probably realize this is one trade where experience really counts.